Sincerity is life blood of a robust spiritual life. It’s one of those good habits I call worldly virtues, meaning virtues essential for living a good life in the middle of the world — in this case, by being honest about our weaknesses along with our strengths, our confusions along with our certainties. But honest with whom? With God, obviously. With other people no doubt. But first, as the basis and starting-point for honesty with God and others, we have to be consistently sincere with ourselves. That isn’t as easy as it sounds. Not everything that passes for sincerity is the genuine article. Where that kind of thinking prevails, Blessed John Paul said, “sincerity, authenticity and ‘being at peace with oneself’” replace fidelity to objective truth. It’s what people used to call letting it all hang out. We see examples every day. I don’t question the lady’s sincerity. Millions of other Catholics, including Republicans, apparently think like her. But what is she really saying? One thing she’s saying is that the gulf between the Church’s ancient, solemn condemnation of abortion as a grave evil and the views of a pro-choice Catholic like herself is just a “difference of opinion.” Nancy Pelosi’s opinion vs. the opinion of the Christian tradition — take your pick. As opinions, both carry pretty much the same weight — though, of course, Pelosi thinks hers is correct. She’s also saying that the right to choose abortion (or, it would seem, just about anything else) — which she calls the “opportunity to exercise … free will” — is absolute, definitive and conclusive for someone who makes that choice. If you choose something you think is right for you, that settles it. There’s no arguing with all-powerful individual conscience. Pope John Paul rejects that out of hand. He says that to have a “good conscience” — to be genuinely sincere — people “must seek the truth and must make judgments in accordance with that same truth” (Veritatis Splendor, No. 62). Today, nevertheless, it’s widely supposed that in matters of morality there is no such thing as objective truth. There’s your truth and my truth and everybody else’s separate version of truth, and each one is as good as any other. Instead of simplifying the quest for sincerity, this makes it nearly impossible to be sincere — honest with God, with other people, and with oneself. Seeking the truth and judging and acting in its light are difficult enough for imperfect people in a fallen world. Today’s moral relativism and subjectivism only make it harder. There’s a powerful illustration of self-deception and its cure in a memorable short story called “Revelation” by the Catholic writer Flannery O’Connor. Prominent in this multitude are “whole companies of white-trash,” crowds of blacks, “battalions of freaks and lunatics.” Bringing up the rear is a cluster of upstanding personages very much like herself. But if we face up to our sinfulness, the passage continues, God “will forgive our sins and cleanse us from all unrighteousness” (1 Jn 1:8-9). God’s forgiveness waits on our acknowledgment of sin. That acknowledgment is a key part of being sincere. Usually it isn’t difficult for good people to recognize the specific, concrete evil actions they perform. Sins like anger, stealing and lust are ordinarily hard to overlook. But it’s different with sins of omission — the failures of love, honesty, compassion and generosity that easily escape our notice. For instance: a husband and father who’s consistently patient and kind with his wife and children but shortchanges them when it comes to giving them his time. He buries himself in unnecessary after-hours work (“That’s how you get ahead,” he rationalizes) along with frequent socializing with colleagues (“We need to relax once in a while”). The result is a persistent neglect of home and family obligations that he chooses to ignore. This man needs to take an honest look at what he’s doing. Or, more precisely, not doing. He needs to be sincere with himself. Examination of conscience and spiritual direction are the two principal means of acquiring sincerity. 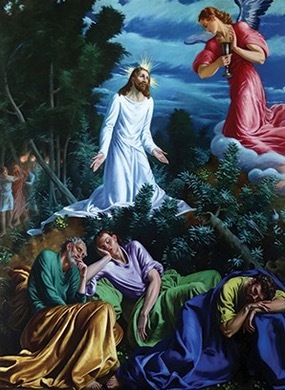 They are — or ought to be — key parts of the spiritual lives of all who aspire not just to be good enough to scrape by and make it into heaven after a long stay in purgatory, but to be true saints, as the Second Vatican Council said they should. Neither is intended only for a small number of elitists. Supposing otherwise is a serious, destructive and all-too-common mistake. Spiritual direction also should be a regular exercise, perhaps once a month. The sessions needn’t be lengthy, but they should be honest and to the point: serious conversations with a reliable guide (a committed Christian, of course, who shares the same values and beliefs as oneself) that help us achieve a clearer picture of our spiritual selves than we’re likely to get alone. Direction doesn’t replace the sacrament of penance, but is complementary to it. To get good results, we have to use the means. Examination of conscience and spiritual direction are means to becoming and remaining sincere. Russell Shaw is an OSV contributing editor. This is the first part of a monthly Year of Faith series on virtues that originally appeared in OSV Newsweekly. Who Are Some Overlooked Popes? Comments Off on Who Are Some Overlooked Popes? Everyone has heard of the big-name popes. There’s Gregory I the Great (r. 590-604), the first to call himself “servant of the servants of God.” There was the influential canon lawyer Innocent III (1198-1216), the warrior Julius II (1503-1513), and several popes named Pius, including Popes Pius VI (1775-1799) and VII (1800-1823), both of whom were taken prisoner by the French in the late 18th and early 19th centuries, respectively. More recently, we have the architect of the Second Vatican Council, John XXIII (1958-1963), and then the beloved John Paul II (1978-2005), maybe the next “Great” pope. But of the more than 260 men who succeeded Peter, there are many overlooked popes. While they weren’t all worthy of entry into a hall of fame, there were many who helped save the Church and change the papacy — and are worth meeting. For nearly three centuries, Christianity was an illegal religion in the Roman Empire, so the bishop of Rome could extend his authority beyond his city only rarely. During the fourth century, Roman emperors tolerated and then favored Christianity before finally making it the one, only and official religion of the empire. As a result, the bishop of Rome could now exercise his unique stature as Peter’s successor and extend his influence throughout the known world of Europe and the Mediterranean coast. 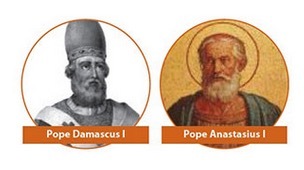 Pope Damasus I (366-384) built on what could be considered moments of papal authority in the Church’s early years. He inherited some examples of Roman bishops intervening in situations such as legal disputes, questions of leadership or Church doctrine and rules. We might even say that he was one of the first “popes” in the sense that he consolidated and centralized papal authority as he acted above and beyond all the other bishops who, until that time, were referred to as papas (Greek for father), too. Damasus said his decision was the ultimate one in disputed questions and cases, making himself the final court of appeals and asserting he could reverse a decision made by archbishops against bishops under them. He set himself up as arbiter when local or regional councils decided on a doctrinal statement or disciplinary action, claiming that no lower decision was final until he said so. Perhaps Damasus’ most influential decision was to commission Jerome, his secretary, to translate the Bible into Latin. This translation, which came to be called the Vulgate, was the authoritative biblical text for Christianity for centuries, and Jerome is honored as a Doctor of the Church. We are sure of at least three papal fathers and sons, but there was only one pair where the son directly followed his father. We should note that this happened at a time when the Church was trying to make clerical celibacy the norm, but priests with sons was not unusual and clearly didn’t stand between a man and the papacy at that time. Anastasius I (399-401) was succeeded by his son Innocent I (401-417). Pope Innocent declared that nothing done by priests and bishops anywhere, no matter how far from Rome, could be considered to be settled until Rome’s bishop gave his approval or rejection. Once the bishop of Rome, acting with his authority as Peter’s successor, made that approval or switch, there was no higher authority to turn to. He also believed that the way liturgies were celebrated in Rome should be the norm for every other Christian site. As Innocent said, all streams flowed from Rome. From 1309 until 1377, the papacy moved to southern France, to a lovely region called Provence and a city that popes built into a lavish second-city Rome named Avignon. While there were good reasons for the papacy to leave Rome temporarily, the papal Curia became entrenched in what was deemed a nicer location and gained a fairly justified reputation for greed. The Italian humanist Petrarch (1304-1374) visited Avignon and declared it the Babylon of the West, which is why people call this period the Babylonian captivity of the papacy. Recent scholarship reveals that while these decades were not the highest moments of Church history, the Avignon papacy was far from a rogues’ gallery. One pope stands out. Benedict XII (1335-1342) had a reputation as a strong investigator of heresy. Born Jacques Fournier, he was a spiritual man and a scholar: a member of the ascetic Cistercian order with a theology doctorate from the University of Paris, the most prestigious school of theology in the Church at the time. He was especially concerned with improving the quality of Church leaders: we find no evidence of nepotism in his record, and he instituted more rigorous examination of candidates for high offices. Pope Benedict fought absenteeism by sending home any priest or bishop in Avignon whose primary job was being a pastor somewhere else. At the same time, it seems he gave up the idea of returning to Rome: he built a huge fortresslike palace, transferred the papal archives to Avignon and reserved for himself many appointments, which had previously been left on the local level, to prevent corruption. Nicholas V (1447-1455) reigned when the papacy was trying hard to regain its footing after the setbacks of the Avignon papacy and the Great Western Schism. Originally Tommaso Parentucelli, as a young man, he was right in the middle of the Renaissance flowering of art, architecture and literature in the key city of Florence, Italy. 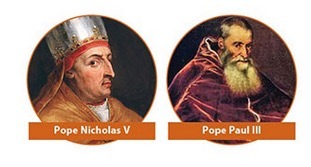 Pope Nicholas did much to restore not only the papacy but Rome as its vibrant heart. He made 1450 a jubilee year, which rejuvenated the city’s economy. Led by Nicholas’ example, Roman families were generous patrons to painters, sculptors, architects, engineers, tapestry designers, weavers and metalsmiths. Nicholas was also interested in the written word and essentially established the Vatican Library. Pope Nicholas collected Greek and Latin manuscripts, often directing that other documents in different languages be rendered into Latin for the archives. He used money gained during the jubilee year to send agents throughout Europe and the Mediterranean to find, buy or copy manuscripts. Even the very word Vatican that we use as shorthand for what the pope and Roman Curia are doing gained new meaning because of Pope Nicholas. The papal home and headquarters had for over a millennium been in and around the Lateran basilica and palace, which the Roman emperor Constantine donated in the early fourth century. Nicholas moved the papal offices to the Vatican hill in Rome, in part because of its historic connection with Peter, the site of whose death and burial had been marked there for centuries. Not only did he relocate the papal bureaucracy there, but, as part of his program to recover papal prestige and burnish its reputation, he made the decision to build a new St. Peter’s Basilica, which eventually became the structure standing there now. One would think that a 25-year-old cardinal who received the honor of a red hat because his sister was a papal mistress would be the last person leading efforts to reform the Church, but that’s just what happened with Pope Paul III (1534-1549). Born Alessandro Farnese to a powerful family, he lived the typical, if distressing, life of some Renaissance cardinals. Not long after being elected pope, he named two of his teenaged grandsons cardinals and gave other offices to his family members. But while at the same time guilty of nepotism, something changed in the man. His mind turned toward reform in the years just after Martin Luther posted his 95 Theses in 1517. As pope, he appointed reform-minded cardinals to the Curia and brought churchmen from outside Roman circles to prepare a report on what was wrong in the Church, knowing that a perspective from afar was needed to break up the entrenched in-house mentality of protecting the home office. Although Pope Paul III could not move against the papal bureaucracy as quickly or completely as he would have liked, he still set into motion the reform mindset that would result with the Council of Trent, which first met during his papacy in 1545. He also looked forward to the future of Catholicism even as those around him counseled retrenchment against Protestantism. Pope Paul encouraged innovative religious orders, such as the Ursulines (founded in 1535 by St. Angela Merici), with their ministry to poor girls, and the Jesuits (approved by Pope Paul in 1540), deeply involved in evangelization, missions, education and the Catholic Reformation. In a real sense, it is Sixtus V’s city that pilgrims continue to visit — the city of Peter and his successors. Christopher M. Bellitto is associate professor of history at Kean University in Union, N.J. He is the author of “Church History 101: A Concise Overview” (Liguori Publications, 2008) and “101 Questions and Answers on Popes and the Papacy” (Paulist Press, 2008). Jesus, “though he was in the form of God, / did not regard equality with God something to be grasped. / Rather, he emptied himself, / taking the form of a slave, / coming in human likeness; / and found human in appearance, / he humbled himself, / becoming obedient to death, / even death on a cross” (Phil 2:6-8). This Scripture passage from St. Paul summarizes the humility of Jesus Christ and his self-emptying, also called kenosis in Greek. The question of Christ’s self-emptying is very urgent today as there are many who question the traditional doctrine taught by the Council of Chalcedon (A.D. 451) concerning the nature of Christ. This applies even to professional teachers of theology, who sometimes teach that Jesus is just a good man who is engraced in the same way any other human being is and therefore is an adopted, not a natural, son of God. There are two basic clarifications which must guide any truly Catholic understanding of Christ. The first concerns what the union of God and man is in Christ. The second concerns how the first doctrine is reflected in certain actions of Christ — for instance, His cry, “My God, My God why have you forsaken me?” from the cross (see Mt 27:46). When God became man in the Christ, this was a true self-emptying in humility. But what was exactly given up? Did Jesus cease to be God? What did He assume? Where does the union of God and man take place? The attempt to explain this belief puzzled the early Christians. They used terms taken from Greek philosophy to attempt to explain the mystery in which they believed. Not that they could exhaust this mystery. That is not possible as it is a part of the ineffable wisdom of God. But since this mystery is received in a human mind, the early Christians used philosophy as a tool to help clarify what they actually believed in. The principle terms they used were: person, nature and relation. In Greek philosophy a nature is a principle of a kind of activity which sets one being off from another. The way a dog acts differs from a tree. This demonstrates that a dog has certain powers different than a tree and so is a different being, possessing a different nature. The individual who possesses a nature which is shared by all the individuals of its species is called a hypostasis. An individual who possesses a rational nature (a hypostasis with a rational nature) is a person. Once the divinity of the Word was determined, the question arose as to how the Word was present in Jesus of Nazareth. Many attempted to explain this by saying that God and man were united in nature in Christ. This did not do justice to what Christians believed or the Christ to whom they prayed. If the union took place in nature, Jesus would have to be really God and only seem to be man, really man or seem to be God, or be a strange monstrous mixture of the two. The heresy which teaches that the union takes place in the natures is Monophysitism, which derives from the Greek words mono(one) and phusis (nature). This would mean that Christ would, in some sense, be just a good man somehow identified with God, or only seem to be man. Instead, the Council of Chalcedon taught that the union takes place in the person. The divine person of the Word who shares the divine nature with the other two persons, at a certain point in time, took unto himself a new way of acting, a human nature, but not a human person. God was not changed by this action, but the world was. What had been called to union with God in nature by a quality of being called sanctifying grace became a new and unheard of relation, and the world was united to God in the person of the Word. The union in person is thus called “the hypostatic union,” which is a grace unique to Christ. Christ does not assume a human person, but only a human nature, a perfect and complete one nonetheless. He has a human soul, intellect, will, passions and body. The Catechism of the Catholic Church recounts for us the definition from Chalcedon: “We confess that one and the same Christ, Lord, and only-begotten Son, is to be acknowledged in two natures without confusion, change, division, or separation. The distinction between the natures was never abolished by their union, but rather the character proper to each of the two natures was preserved as they came together in one person (prosopon) and one hypostasis” (No. 467). This means that the emptying of Christ in being consisted in His will to join human nature to His actions as a divine person, to act through it and to only hide the glory of His divine nature so that He might suffer the passion: “What he was, he remained; what he was not, he assumed” (Catechism, No. 469). The one divine person, Jesus, thus acts in two natures. In Scripture, He even demonstrates this because He speaks in both natures as one person often in the same verse. “Now glorify me [human nature], Father, with you, with the glory that I [divine nature] had with you before the world began” (Jn 17:5). This new relation between God and the world is a sheer grace, and it is also a miracle. St. Paul’s Letter to the Philippians continues the passage about the nature of the self-emptying: “God greatly exalted him” (2:9). Does this mean Christ was not exalted in being before the Passion? Often, things are said to occur in Scripture when they come to our knowledge. Before the Passion, Christ rarely demonstrated His divinity. But after the Passion, in the Resurrection and the Ascension, His divinity becomes clearly demonstrated to the apostles. They come to know it. One of the difficulties with this position is how one can dogmatically explain the cry of Christ from the cross: “My God, my God, why have your forsaken me?” Many theologians today hold that Jesus was forsaken because He had no idea He would rise from the dead, that He threw himself into a kind of existential darkness characterized by faith and just accepted the meaninglessness of life. So, His experience of death would be the same as ours. This is impossible. In what sense can Christ be forsaken on the cross? He cannot cease being the Word of God within the Trinity. This is His personhood. He cannot cease being the Word made flesh. This union is permanent once embraced. He cannot sin as this would war against His mission, which is to atone for our sins by His perfect obedience on the cross. The traditional teaching of the Church is that Christ enjoys the beatific vision from the moment of His conception in the womb of His mother in His human intellect. This is not formally defined de fide, but has always been considered proxima fide, meaning that to deny it entails so many problems for other doctrines that it must be affirmed. If Christ were not to have this and therefore have faith on the cross, this would mean that He would have to merit it for himself as man and, in principle, could sin. In fact, faith is never attributed to Christ in His earthly life, and the ability to sin would again compromise His mission. The only way Christ can be abandoned by His Father on the cross, then, is by external protection. Many times Christ’s enemies sought to put Him to death, beginning with Herod, when Christ was a baby, and God protected Him. The dogmatic difficulty here is resolved if one considers that “My God, my God, why have you forsaken me?” is the opening verse of Psalm 22 (RSVCE). If one reads the whole psalm, it is very far from a cry of despair and existential angst. The psalmist does suffer intensely, but the psalm ends with a hymn of thanksgiving to God and confidence that God will vindicate his sufferings. This will, of course, happen in the resurrection of the dead. Moreover, Thomas Aquinas thought that no one could freely give himself to the kind of suffering Christ embraced on the cross unless he knew about the resurrection of the dead. The self-emptying of Jesus then is only a self-emptying in being in the sense that God should choose to take to himself a human way of acting and suffering. Psychologically this emptying does not involve sin. It is not even done in faith. Rather, in this suffering Christ experiences the greatest pain possible. This is the case physically because His body was more sensitive than a normal body as it was perfectly fashioned by the Holy Spirit. He therefore suffers more in the bruises, the scourging, the nails and the hunger and thirst. He also suffers mentally because he personally experiences all the human sins which will be committed and have been committed in the history of the human race. He knows these through the beatific vision He has on the cross. He does not allow this vision, or His glory as God, to enter into His lower self precisely so He can suffer the Passion. He feels abandoned by God, but knows internally He is not. This is a cause of acute pain both physically and mentally. But the internal union of the hypostatic union is preserved. So, in Jesus, we see how much God loves us. We should therefore be caught up in love of the God we cannot see (see Roman Missal, Christmas Preface). Father Brian Mullady, O.P., S.T.D., earned his doctorate in Sacred Theology from the Pontifical University of St. Thomas Aquinas in Rome.